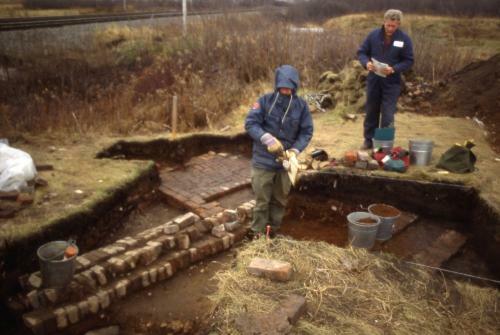 A professional dig in 1988 on the possible site of the Albion foundry revealed foundation walls, a brick walkway and other features. Digs undertaken in 1987 revealed the foundation of an early locomotive shed, part of the foundry yard, and a domestic building. In 1988, work concentrated on the foundry, uncovering two foundation walls, a brick walkway surface and a brick-sided channel covered with metal plates. Twenty-five hundred artifacts were recovered, mostly of iron and relating to the foundry. Subsequent digs in 1989 and 1992 revealed more of the brick-lined channel (to the right of the 2 buckets in the pit). What was the purpose of this channel? Did it protect cast iron piping?